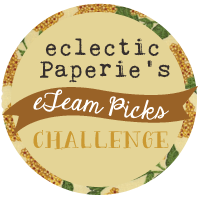 Welcome to eclectic Paperie's first eTeam Picks Challenge! The eTeam Picks Challenge is held on the third Thursday of each month and each challenge is an opportunity for you to be inspired by one of our eTeam’s creations, to share your work, and to be entered into our challenge prize drawing. Marjie Kemper here as your host... I've chosen the theme of Altered Boxes. The eTeam Picks Challenge is all about inspiration and having fun! During each challenge one of the eTeam members will share a topic, word, technique, sketch, or product that will become the foundation for your creation. This challenge is all about mixing it up and just enjoying the creative process... anything goes! We want to see your work and hear about your inspiration. All of those who play along with our challenge will be entered into a prize drawing for a $15.00 gift certificate to the eclectic Paperie store. Choose any box you wish, and change it in some way. As you can see, I've transformed a tissue box holder. It was plain white to begin with, and it soaked up my Dylusions Ink Sprays quite nicely. I used lots of stamps and stencils to decorate. Don't worry if your stamping isn't perfect. I went in with a fine point pen and filled in the gaps where the stamped border was off below. I used Dylusions Ink Sprays in a water brush (love those - see my stash? That was a splurge last year - one for every color!) to color my leaves, and black ink on my blending tool to fill in the spot showing on the black wavy border. You do not have to use products sold in the eP store…but we do love it when you do. When uploading to any online galleries, please use any of the following keywords; eP, eclectic Paperie or eTeam Pick Challenge. Link your creations to the eP blog. If you’d like to be considered as one of our featured projects and be entered into our prize drawing, please be sure to add your link no later than 6pm EST on Thursday, January 31st. Marjie .....stunning ....the colors, stencilling and stamping..love it all!! Completely fabulous - love the layers of stencilling and stamping... ordinary household object made into art!! What a fun tissue box. I want one for every room in my house now! I love how I learned something new. I didn't know you could put Dylusions in a water brush and paint with them. Of course! What a great idea. I've been stocking up on mine trying to get the courage to use them. You did an awesome job! Your box is fantastic, love all the stenciling. Please let Donna Marie know her cheese box is over the top I couldn't leave a comment for some reason on her blog. I had my idea all pick out but now I'm rethinking after seeing all these beautiful works of art. Love this, Marjie!! What a great way to dress up an ordinary box...Fabulous! Great inspiration from all the DT! Could not leave a comment for Donna, but did love her altered cream cheese container! wow, that is an awesome looking box and I'm still working on getting a waterbrush for every color, lol. Ok, I'm going to finish my altered box this weekend for sure :-). Fun box love those Dylusions inks and stencils ! I'm just starting to "play" with those ... so fun ! 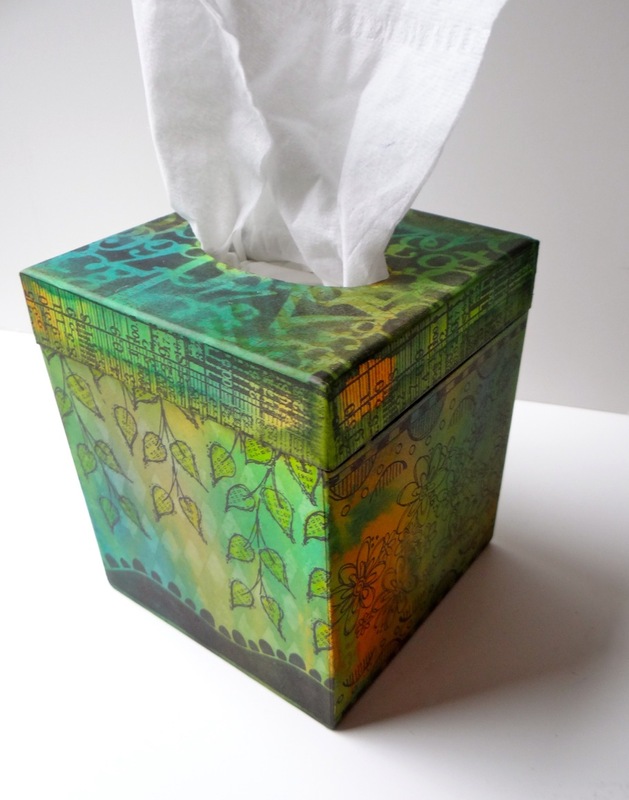 What a great tissue box...you'd never get tired of looking at. I am such a sucker for those leaves though! Such a fabulous altered box Marjie, it's bright, vivacious and great fun. What a great mix of stencilling,stamping etc Luv the colours u have used. Gorgeous altered tissue box Marjie. I love the beautiful, bright colours and your gorgeous stamping & stencilling. I love the vivid colours of Dylusions ink, so vibrant. I have just emptied another tissue box this morning due to my horrible cold, I was actually holding on to it, to do something creative with it later on too. Thanks for hosting this Marjie. Awesome challenge and inspiration from the DT! Thanks! I LOVE your box and am so excited to have found your blog and website :) I saw your link on Jessica Sporn Designs and dropped by. Now following you, and entered the challenge. I can't wait to see more boxes and other projects. Thanks for hosting the challenge! OOPS! in my excitement to find you, I realize that I linked up a box that I altered this past summer which is not in the spirit of the challenge. I'm not able to remove the link. Can you help? I'd love to alter another box this weekend and enter that instead. No worries, Rox.... we'll straighten it out ASAP.